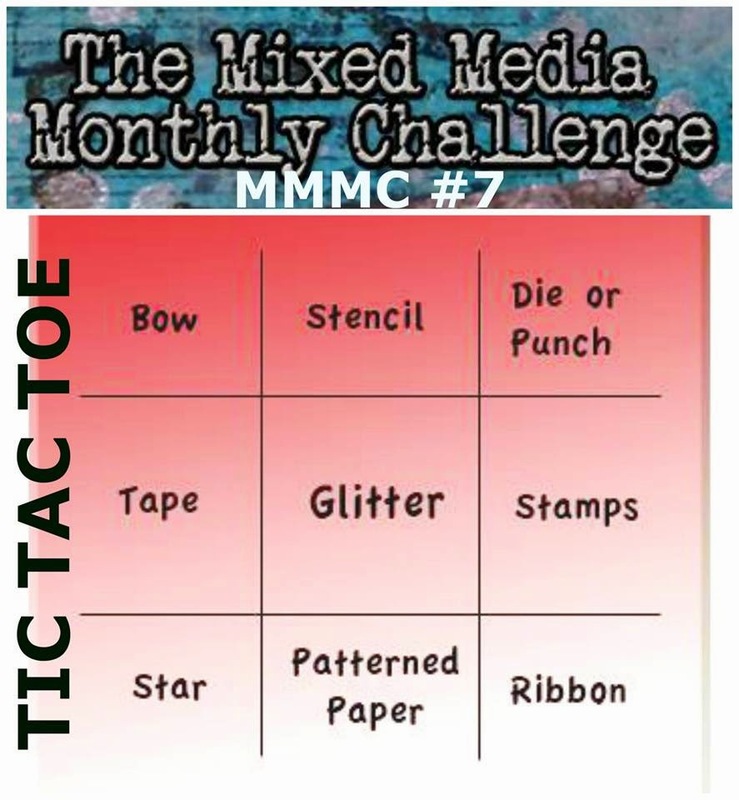 It's time for another fun challenge over at The Mixed Media Monthly Challenge Blog. This month we're playing TIC-TAC-TOE!! Just make Tic-Tac-Toe in any direction and be sure to tell us in your description which three things you did in your project. If you can make it more than one way, be sure to tell us. This is also my first project for the 12 Days of Holiday Projects. Here's my December Holiday Project. I made Tic-Tac-Toe by using a Star, Die (star), and Glitter. 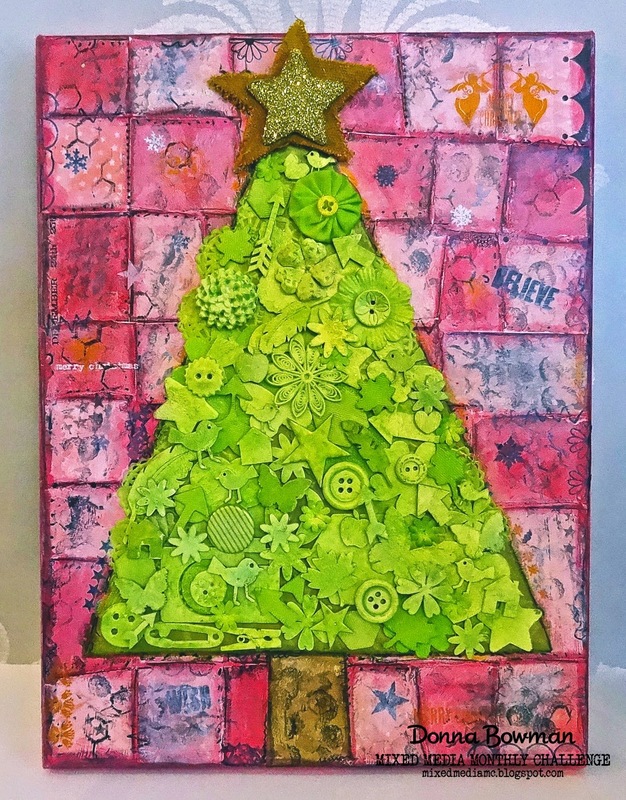 For information on how I created this canvas, please see the Mixed Media Monthly Challenge Blog, I have a detailed tutorial there. This background was inspired by a canvas I saw Christy Tomlinson make on a video in one of her online classes. 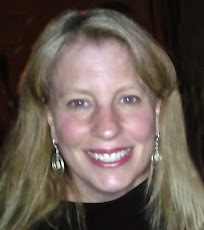 She is amazing, if you haven't taken one of her online classes yet, I would highly recommend that you do. And, she puts the older one on sale several times a year!! This is so fun and really easy to do. I hope you will try something like this and let me know when you do so I can take a look!! I would love to see how you interpret this process. 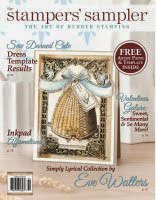 Keep reading for info of the 12 Days of Holiday Inspiration Blog Event. This is also my Day 1 Project. Welcome to Day 1 of the 12 Days of Holiday Inspiration Blog Event brought to you by "The Inspiration Crew". We’re just a group of online crafty blog friends who love being creative. This time we're doing a 12-day event to provide you with tons of Holiday Inspiration. Lovely project! So bright and fun! GREAT project - love finding new embellies each time I look at the tree!! So cute - love all the bits and pieces on the tree, especially the little birds. Oh, I saw this on the challenge page and read how you made it. totally awesome! 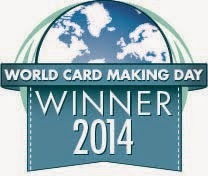 & thanks for the opportunity to win, I LOVE getting happy mail! very clever way to fill a shape, Donna! I love the bright colors of this piece! WOW...what an awesome project!!! Interesting how you put it all together, too!! Wow, this tree is stunning. Love this project Donna. Will try to hop each day. 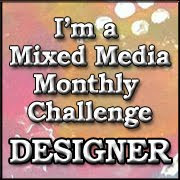 I will be entering this month's mixed media monthly challenge. Yippee. Wow, just look at all that texture and color! What a unique and fun canvas! this is awesome - love the details and colors! Love all that texture! Great project!